A winter themed ring handmade with a glittering silver plated snowman, designed with lots and lots of shimmering rhinestones, that has been set upon a silver plated adjustable filigree ring base. The base for this handmade ring is adjustable, which makes the ring comfortable no matter the size of the wearer's finger size (6 and up) as well as ideal for switching from finger to finger depending on mood or preference. 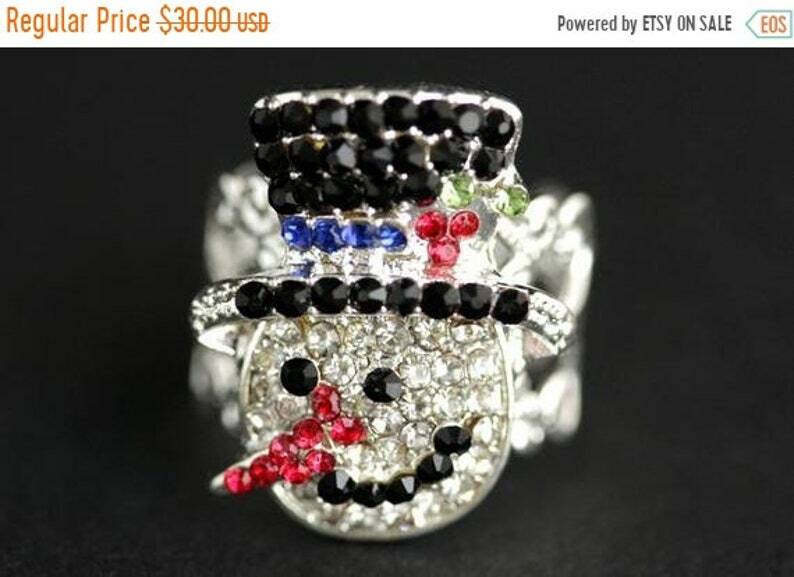 EASTER SALE Christmas Ring. Santa's Reindeer Holiday Ring. Deer Ring. Adjustable Ring in Bronze. Christmas Jewelry. Handmade Jewelry. EASTER SALE Eiffel Tower Necklace. (CHOOSE Your Color) Eiffel Tower Charm Necklace with Teardrop and Pearl. Handmade Jewelry. Snowman Earrings with Green Scarf. Holiday Jewelry. Snow Man Earrings. Christmas Earrings. Stud Earrings. Post Earrings. Handmade Jewelry.